Mash the potatoes in a saucepan. Add the peas, chiles, raisins, soy sauce, curry powder, coriander, cumin, chili powder, and salt and pepper to taste. Mix well and heat over medium heat until hot, stirring as needed, 4 to 5 minutes. Cut the tortillas into quarters. Spoon about 2 tablespoons of the filling in the center of each tortilla piece. Fold one side over the filling and press lightly to flatten. (The filling will hold the tortilla in place.) Set aside. Repeat with the remaining ingredients. 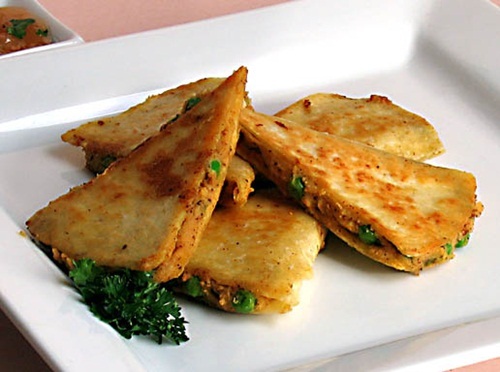 Arrange the samosadillas in a nonstick skillet over medium heat. Cook until lightly browned and heated through, turning once, 6 to 8 minutes total. Serve hot with chutney.